REWRITING THE FUTURE OF ORGANIZATIONS is the purpose of dwarfs and Giants. REWRITING THE FUTURE OF ORGANIZATIONS is the purpose of dwarfs and Giants. What does that mean and why? We are in a world of changes occurring at unprecedented speed and impacting with unprecedented scope. At the beginning of the 21st century, more and more organizations are approaching the limits of the previous ways of working and organizing. Leadership, workforce and societies as a whole are facing real tensions — losing meaning and trustworthiness of their relationship. Their orientation, functionality, and adaptive capacity in an ever-dynamic, complex and unpredictable world are faltering. To radically change this is why dwarfs and Giants exists. We believe that the future of work and organizing can´t be built on the principles of the past. Thus we have to rewrite the fundamental ideas of how we work, lead and organize. societal levels — unsolvable by the means of previous organizational principles. On the individual level, we see people frustrated and disengaged, lacking meaning in their work. In high-pressure work-environments, they face the challenge of handling ever-more information in structures that are not designed to support this complexity. This leads to work-to-rule and high burn-out-rates — a far cry from living fully and developing one’s complete potential. – growing inequality, enormous income gaps, societal instability and alarming systemic risks. Painful change-processes are introduced to fix the problems, yet achieve very little success since they do not touch the core of how power is organized. We believe that simply pushing harder within the old boundaries will not do. We have to shift the fundamental principles of how we work, lead and organize. We call it moving to the next:land of organizing — a land that builds on fundamentally different principles better suited to make organizations and people thrive under dynamic complexity. For next:land organizations, being organized for purpose means creating orientation and alignment by looking inside. What is it that you want to bring into an outer world that is highly complex and unpredictable? Clarity of purpose on this creates a shared higher meaning and attracts customers and talent. To organize in order to fulfil your purpose is a shift from push to pull. 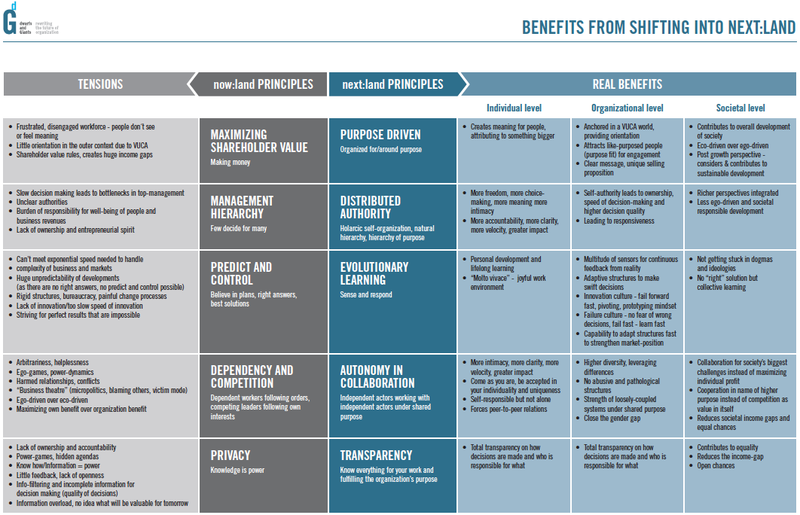 Success and shareholder value become by-products of fulfilling your purpose, which can nevertheless evolve over the life path of the organization. next:land organizations are designed for responsiveness to solve complex business challenges in ever-changing environments. Decision-making processes are built to integrate various perspectives and distribute the authority where the best know-how and decision-making ability reside. Building natural hierarchies occurs naturally by hierarchy of purpose. next:land organizations are designed to adapt quickly as they go. Sensing into what is needed and responding quickly are baked into all their structures and processes. Rather than insisting on one right answer or decision, they are designed for continuous learning — and even failure is considered as a valued part of the game. collaborating with high autonomy and self-responsibility. Clear roles and authorities allow for ownership and entrepreneurial spirit while contributing to something bigger than oneself. where knowledge no longer results in individual power. High levels of trust are the result.